Ocean Ripples Resort is a newly established budget boutique resort situated in Wadduwa, A local fishing village in the suburbs of Colombo. Built on 1 acre of environment friendly land surrounded by coconut trees and stretches of grass. The theme of the resort is “boutique” which gives a unique experience and makes guests feel that they are at home involved in the culture and history of this beautiful island Sri Lanka. The pool is centrally located and the view from the pool is spectacular. In front the guests can view the trains passing by and on the other side the view of the dining hall of boutique restaurant. Next to the pool is the garden with sun beds so you can doze, read or just listen to music. Wi-Fi is Free and the coverage is throughout the resort. Indoor games like Chess, Checkers and playing cards can be enjoyed within the property. Our rates are also reasonable and will definitely suit your budget. Situated on the west coast of Sri Lanka approximately 50 minutes drive from the Commercial Capital Colombo and 65 km from Bandaranaike International Airport. Wadduwa is close to many tourist destinations like Galle, Colombo and Kalutara. The resort is a 5 minute walk from Wadduwa Railway Station and 5 minutes from Wadduwa Town. 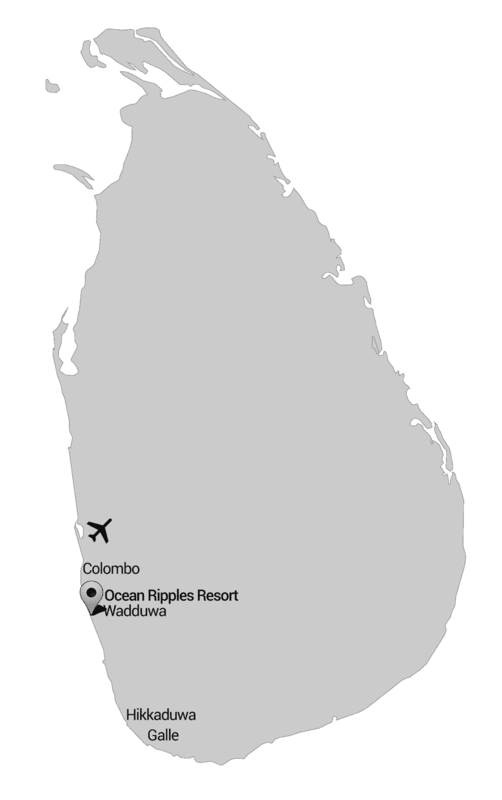 Bandaranaike International Airport is 1 ½ hours away by car. Wadduwa as a destination is selected by many tourists to relax after flying for hours nonstop. And as a rest stop before leaving to airport after touring. Experience Ocean Ripples Resort Wadduwa. Book for 7 nights and pay for 6 nights only. Stay 5 nights or more and get a 10% discount. Web Solution by SurfEdge 2017.